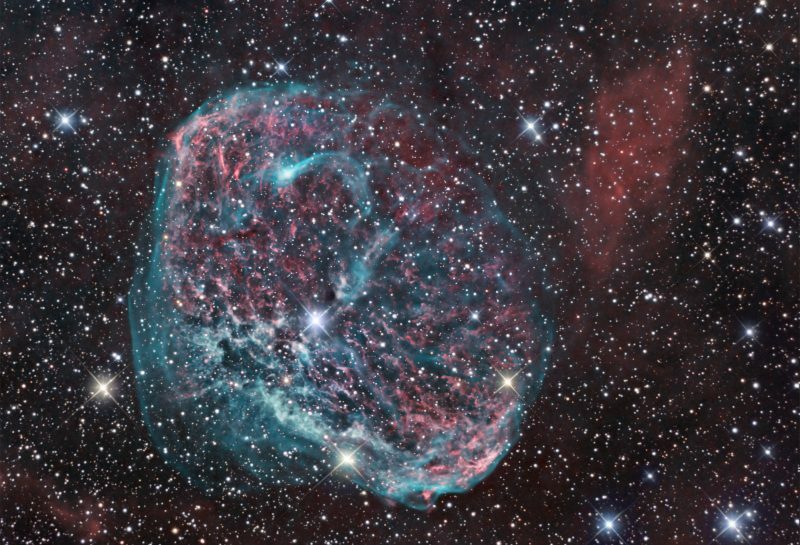 NGC 6888, AKA the Crescent Nebula, is a popular target for astrophotographers in the constellation Cygnus — it’s about 12 x 18 arcminutes in size, and located about 2 degrees southwest of Sadr (the center of the Northern Cross). NGC 6888 is probably about 5000 light years distant, and formed by the stellar winds associated with Wolf-Rayet star WR 136. As an emission nebula, it is easily captured by a hydrogen alpha or OIII filter. Data was acquired at MYHY Observatory in the Philadelphia suburbs. 28 hours of hydrogen alpha and 6 hours of RGB data with an OGS 10″ RC (from 2007) was combined with 18 hours of OIII data with a Takahashi FCT-150 (from 2018). All photons were captured using the SBIG STL 11K on a Paramount ME. Data reduction was in Maxim, star alignment in Registar, and subframe integration in PixInsight. RGB combine/ABE and curves were in PixInsight; all other Ha/OIII processing was in Photoshop. The image was assembled as a bicolor, using Ha=Red/OIII=Green/OIII=Blue, after which time the RGB stars were added back. (The RGB data per se contributed negligibly to the nebula, and was not used for other than the stars.) Noise reduction was via Neat Image, a Photoshop plug-in.